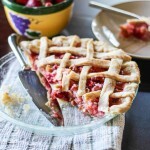 This strawberry rhubarb pie recipe is marriage of sweet and tart all wrapped together in one delicious pie crust. In a large bowl, combine sugar and tapioca. Add fruit and toss to coat. Gently stir in orange juice, marmalade, and zest. Let stand for 15 minutes. Line a deep-dish 9 inch pie plate with bottom crust; trim excess pie dough. Add the filling. Roll out the remaining pie dough; make a lattice crust. Trim, seal, and flute the edges. Cover edges with foil. Bake at 400 degrees for 40-50 minutes or until the filling is bubbly and rhubarb is tender. Remove the foil. Cool on a wire rack and store in the refrigerator. This pie is delightful warmed up and with a dollop of whipped cream!